Carabao Cup holders Manchester United reached the quarter-finals with a comfortable victory at Swansea City. A much-changed United side controlled the tie and led at half-time as Marcus Rashford's deft back-heel allowed Jesse Lingard to score with a neat low finish. The visitors doubled their lead in fine fashion after an hour, with a sweeping team move teeing up Lingard to head in his second. Swansea, who had made eight changes themselves, offered precious little in attack as they succumbed to a fifth defeat from six home games this season. Although United manager Jose Mourinho has won the League Cup four times during his career, he had suggested after the third-round win over Burton Albion that teams in Europe could benefit by not playing in this competition. It was therefore no surprise that United made seven changes for their trip to south Wales, having suffered their first Premier League defeat of the season at Huddersfield on Saturday, after which Mourinho criticised their "poor attitude". The barb seemed to have the desired effect, with three of the players involved at Huddersfield - Lingard, Rashford and Anthony Martial - setting the pace for a vibrant United start in Swansea. The first two combined beautifully for the opening goal, as Rashford artfully flicked an Ander Herrera pass into the path of Lingard, who guided his low finish into the bottom corner. United's second goal was equally impressive. Axel Tuanzebe started the move with a marauding run from defence and spread the ball to Matteo Darmian, whose pinpoint cross was headed in by Lingard. Mourinho said that his side's application and concentration, like the result, were much improved from the weekend defeat at the John Smith's Stadium. "Our attitude was very good. I'm really happy," he said. "We were solid, we were comfortable, we were in control." The victory marked Mourinho's 400th game in English football, accumulated over two separate spells at Chelsea as well as his time at Old Trafford. "Of course I still get the same thrill from it, but 2004 was a long time ago," said the Portuguese. "I am more mature and have a different way to react to things. I'm the same. I want to win and I hate losing." Swansea's indifferent start to the season had seen them lose four of their five home league games, prompting head coach Paul Clement to make eight changes to the team beaten by Leicester on Saturday. The squad rotation was meant to give some of his players a rest, but Clement's worst fears became reality at the end of the first half as Martin Olsson - the club's only specialist left-back - was forced off the field with a hamstring injury. His withdrawal compounded a forgettable evening for the hosts as they barely forced their opponents out of first gear. Among Swansea's new faces was 21-year-old striker Oli McBurnie, making his first start of the season after his proposed loan move to Championship club Barnsley had fallen through on transfer deadline day because the deal's paperwork had not been completed correctly. However, his isolation up front was symptomatic of a Swansea display almost entirely devoid of attacking threat. Swansea manager Paul Clement: "Always disappointed when you lose a game. We actually played better than we have been recently but Manchester United deserved to win the game, no question about that. "We created a decent amount of chances, maybe nothing clear-cut until the last moment when [Sergio] Romero made that save from a set-play. "They deserved the victory, they had the extra bit of quality and from our point of view, we just have to believe a good result and good performance is around the corner. "We have to show determination to get through this difficult time that we're having." 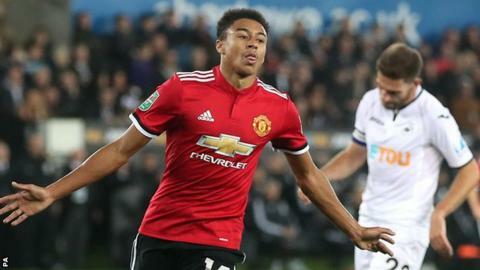 Given licence to roam in a central attacking position behind the forwards, Lingard waltzed his way past a porous Swansea defence to help himself to two excellent goals. Match ends, Swansea City 0, Manchester United 2. Second Half ends, Swansea City 0, Manchester United 2. Corner, Swansea City. Conceded by Sergio Romero. Attempt saved. Leroy Fer (Swansea City) left footed shot from the right side of the six yard box is saved in the centre of the goal. Assisted by Mike van der Hoorn. Attempt missed. Mike van der Hoorn (Swansea City) header from the centre of the box misses to the right. Assisted by Ki Sung-yueng with a cross following a corner. Corner, Swansea City. Conceded by Scott McTominay. Attempt blocked. Kyle Naughton (Swansea City) right footed shot from outside the box is blocked. Assisted by Leroy Fer. Attempt blocked. Nemanja Matic (Manchester United) left footed shot from the left side of the box is blocked. Assisted by Jesse Lingard with a cross. Substitution, Manchester United. Luke Shaw replaces Anthony Martial. Corner, Manchester United. Conceded by Alfie Mawson. Attempt blocked. Jordan Ayew (Swansea City) right footed shot from outside the box is blocked. Assisted by Sam Clucas. Attempt saved. Jesse Lingard (Manchester United) left footed shot from outside the box is saved in the centre of the goal. Assisted by Matteo Darmian. Offside, Swansea City. Tammy Abraham tries a through ball, but Wayne Routledge is caught offside. Foul by Alfie Mawson (Swansea City). Offside, Manchester United. Sergio Romero tries a through ball, but Anthony Martial is caught offside. Attempt saved. Jordan Ayew (Swansea City) right footed shot from outside the box is saved in the top right corner. Axel Tuanzebe (Manchester United) is shown the yellow card for a bad foul. Foul by Axel Tuanzebe (Manchester United). Attempt saved. Tammy Abraham (Swansea City) right footed shot from outside the box is saved in the top centre of the goal. Assisted by Sam Clucas. Substitution, Swansea City. Tammy Abraham replaces Oliver McBurnie. Attempt missed. Axel Tuanzebe (Manchester United) right footed shot from very close range is too high following a corner. Attempt saved. Chris Smalling (Manchester United) header from the centre of the box is saved in the top right corner. Assisted by Jesse Lingard with a cross. Corner, Manchester United. Conceded by Mike van der Hoorn. Substitution, Swansea City. Leroy Fer replaces Roque Mesa.